Lodore Canyon Trip Review: Our best Women's trip so far! 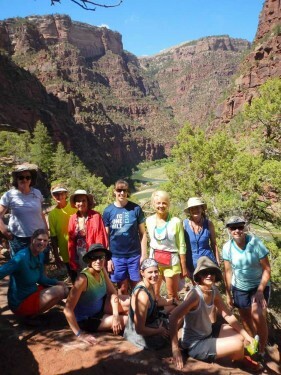 Lodore Canyon Trip Review: Our best Women’s trip so far! Our best Women’s trip so far! I just want to tell you how wonderful the raft trip was. All of the women are still raving about it and talking about going on another. It really went above and beyond all expectations, and for me that includes the planning part and working with you to make our women’s trip the best so far. The food was beyond impressive and I don’t even have to say “for camping food”. Everyone was surprised at the variety of offerings, how good it was, and the details that went into preparing and presenting. Of course we were also impressed that you could safely feed gluten free and garlic free eaters with delicious appetizers, pancakes and dinners that we don’t even treat ourselves with at home! I don’t know how you manage to hire such great guides. We felt safe in their expertise, but they also waited on us hand and foot (see photo). Plus they socialized in the evening after working incredibly hard all day. It was fun seeing Kerry again and the women all enjoyed his stories and that he would share so much about the land and geology. I will be contacting you within the next few years for a trip with my family. I can’t wait to do another trip with your company, nor can I thank you enough!